Sleek and bold, this stunning console will refuse to be ignored. 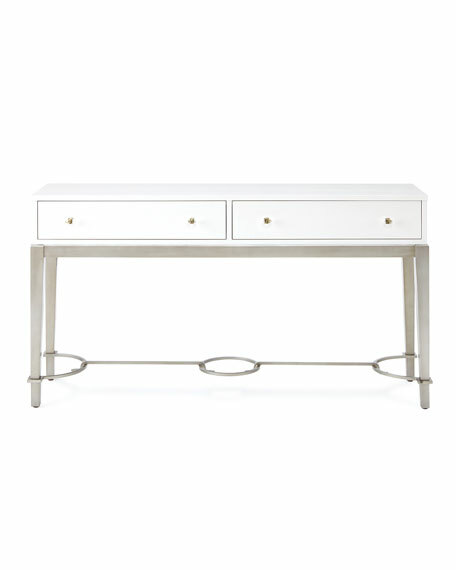 Done in a crisp white finish with a champagne silver metal base and clear drawer pulls this silhouette is a fresh approach for a console. Two functional drawers are lined with contrasting wallpaper on the interior, while the base features a unique ring motif on the stretcher. Handcrafted console with two drawers. Poplar and hardwood solids; maple veneers. Wallpaper lined drawers; metal and silver leaf trim. 65.3"W x 17"D x 34.5"T.